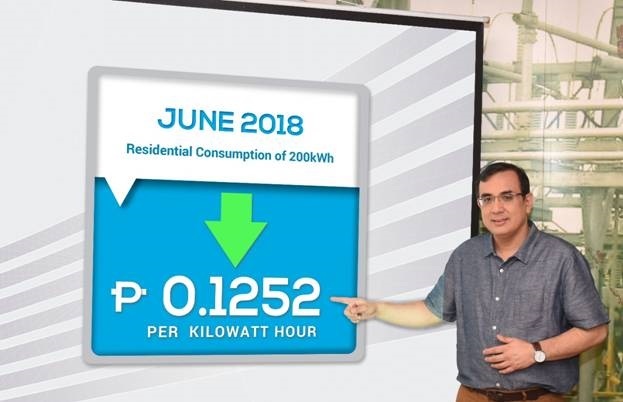 The Manila Electric Company (MERALCO) announced a decrease of Php 0.1252 per kilowatt hour (kWh) in power rates this June for its residential customers. Households consuming 200 kWh will gain savings of Php 25 in their electricity bills. Brought about by lower generation charges and most other cost components, Meralco Public Information Office Head Joe Zaldarriaga (in photo) explained that this was the second month of consecutive rate reductions. The reduction would have even been lower if not for a higher Feed-in Tariff Allowance (FiT-All) rate of PhP 0.0733/kWh. FiT-All is a pass-through charge meant to incentivize renewable energy (RE) developers, such as those operating wind, solar, biomass and run-of-river hydropower facilities. Despite the drop in electricity rates, Meralco still encourages its customers to practice energy efficiency to manage their consumption – like unplugging appliances when not in use to avoid “phantom load,” turning the aircon at 25°C mid-setting to maximize efficiency, using a power board or strip to help manage appliance use, making the most of natural light during daytime, and keeping appliances well-maintained.